For the Nintendo VS. System game, see VS. Duck Hunt. Duck Hunt is a Nintendo-developed video game for the Nintendo Entertainment System. 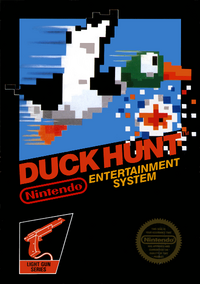 The game utilizes the NES Zapper to shoot ducks to earn points. "Take aim, fire and score! It's DUCK HUNT! Your trusty hunting dog wades into the marshes to flush out your prey. Your fingers tighten around your Zapper™ light gun. Suddenly, there's a duck in the air! You've only got three shots to bag this duck, and if you miss, even your dog laughs at you! But become a sharp-shooter, and you'll progress to the next round where two ducks fly up at the same time. And then you're on to the ultimate challenge: Clay Shooting. Where you'll compete in a wild clay-pigeon shooting contest! Play DUCK HUNT and discover that you can have lots of laughs and be challenged at the same time." Duck Hunt is a shooting game in which the objective is to shoot all the ducks on the screen. Each level of the game has ten possible targets, and the player is required to shoot a certain number of targets before being able to progress to the next level. As the player progresses, gameplay becomes harder, with targets moving faster. This page was last edited on 23 March 2019, at 18:12.